Global Games is our sport’s best opportunity to draw conclusions about the international community, pitting elite players from all over the world against each other with national glory on the line. The Eighth Man staff, some of which attended the event, came together to write about our conclusions from the tournament. The rest of the world needs two things in order to compete with Team USA at Global Games: depth and competition. Even the United Kingdom, who gave Team USA the toughest game, had depth problems, and, eventually, the superior depth of the US roster took control of the game and ran them off the field. Despite the lopsided results of the Team USA games, I think the talent of the “best” player on each team was pretty similar. The proof is in the seekers: as the position requiring the least depth, even smaller countries would be able to find the talent for a proper “depth chart” at the position, whereas fielding a proper quaffle player depth chart can require up to 12 talented players. When you look at the tournament’s seekers, talent is exactly what we saw. While Sam Roitblat was the class of the tournament for the USA, the day was marked by plenty of spectacular catches by the likes of the UK’s Robbie Dugal Young and Australia’s Dameon Osborne, who was only in because of a practice injury to Emmanuel Berkowicz, a player that showed himself to be of a similar level at West Fantasy, finishing with a 3-1 SWIM. But, to truly compete with the US, the rest of the world not only needs more elite players, but it needs to train those players against elite competition. By my count, 18 of the 21 players from Team USA come from programs in areas that have regular, elite-level competition. Even the three players from the weakest areas—Kyrie Timbrook from the Bay Area and Sean Pagoada and Shannon Moorhead from Florida—played schedules that got them as much high-quality opposition as possible. Playing a stronger schedule doesn’t just improve your team faster, but it also means that you’re used to the demands of elite play, which makes big-stage tournaments like World Cup or Global Games significantly less pressure-inducing and, in turn, improves performance. Australia’s choice to play in West Fantasy clearly paid off, as they entered the tournament aware of their opponents’ capabilities. Other teams who had not took more time to adjust. Of course, the end of the World Cup makes this much more difficult in the future. We will no longer see the likes of the University of Sydney or Paris Phenix jumping into the biggest American tournament. But we can only hope, for the good of the development of the game worldwide, that new options present themselves. The IQA, now USQ, made it clear long ago that it doesn’t prioritize video. The World Cup V Field Four tape disappeared into the black hole of quidditch bureaucracy, and all signs point to the World Cup VII Field One video, which USQ TV Show Coordinator Daniel Shapiro processed and sent in, doing the same. But all of that pales in comparison to Global Games. This tournament was not only a marquee event within the sport, but also lent itself to being taped in a way World Cup does not. Instead of nine fields, there were only two. Instead of 80 teams, there were only seven. First, the organization chose a location that made a live stream impossible, and the quidditch community accepted that quickly-produced video after the event would suffice. Then it said it did not have enough volunteers to pull it off, and the community stepped up. The tournament went off without a hitch, and we all eagerly waited. After all, all that was left was sending and processing. Well, two weeks later, we’re still waiting. Team UK had all seven of its games up on YouTube the next day. The USQ? Still at one-and-a-half games. It’s impossible to not see the importance of the video for this tournament. Teams came from around the world, and their fan bases couldn’t possibly have come with them. The tournament was a massive media draw, and even having a little film for an Australian news affiliate to use in their story went a long way in making our sport seem that much more legitimate. Imagine if they had all of the team’s film to use, instead of just their disappointing finals loss. 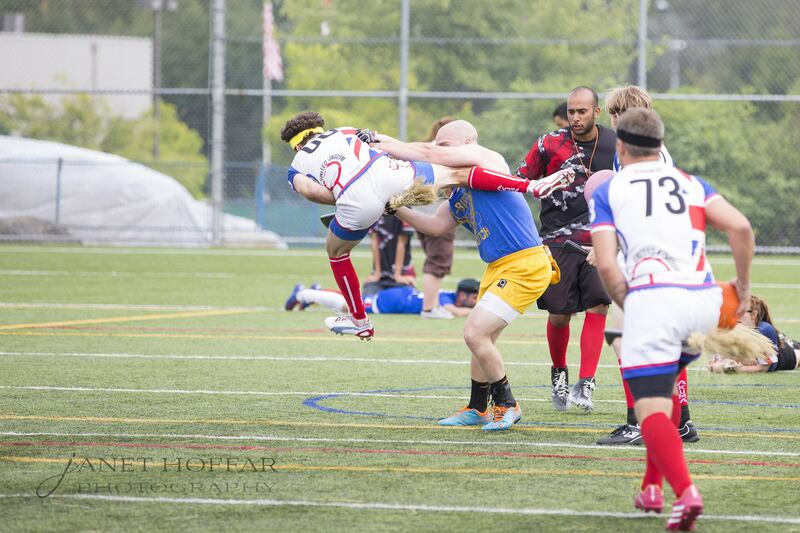 Quidditch is on the precipice of really getting somewhere in the sports community. The players are getting more athletic, the rules and officiating more standardized and the play more impressive. Video is that last push we need, a way to advertise to potential new players, a way to shoot down naysayers that assume the sport is a joke because they’ve never seen it. Hopefully the USQ gets the message faster than we get the video. When Global Games was first announced, nothing was assured other than death, taxes and a one-two finish for Team USA and Team Canada. But some pretty disheartening things happened on the way to Vancouver, and, in the end, Canada wasn’t sitting comfortably on the podium, they were clutching its lowest rung for dear life. 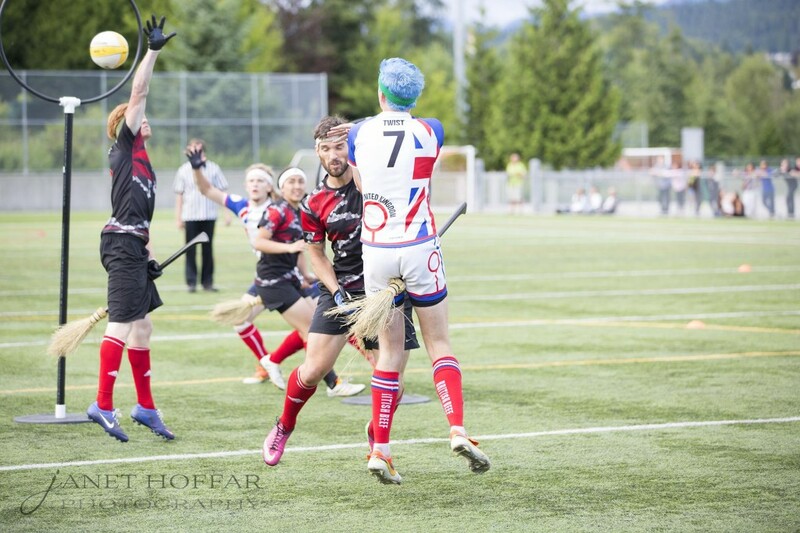 The story of Canada Quidditch over the past year is bigger than this one team, but the national team is a neat microcosm of it all. Canadian administration pushed hard for autonomy from the American-heavy IQA, eventually playing a large part in the split that took place on July 1. But in doing so, they put the onus on themselves to prove that they had self-sufficient leadership and a level of quidditch that wouldn’t suffer from a potential competitive split from the United States, a topic that remains up in the air. When looking at the national team through these two prisms, it’s hard to give Canadian quidditch anything but a failing grade. First there was the questionable choice in team leadership: a co-captain that had proven in the past that personal feelings affect her roster decisions. Then there was the roster itself: far from perfect. Brian Wong and Wesley Burbidge put up impressive performances at the tournament, highlighting how incredible it was that they were selected merely as alternates. Then, as though there wasn’t enough controversy surrounding the roster to begin with, the players were threatened with expulsion from the team after the names were leaked prior to the official release of the roster. Of course, with their backs against the wall late in the United Kingdom game, Canada saved face by putting a sixth male-assigned-at-birth playes on the pitch and taking a chokehold of the bludger game. Without getting into the actual gender nature of a player, what we know is that they had identified as male in the USA game and Canada did not go to the set until they really needed it. From an outside perspective, it screamed of desperation. Perhaps then, it’s fitting how things ended. Australia beat Canada on a snitch grab to knock them out of the gold medal game, and then the United Kingdom sported six male-assigned-at-birth players for most of the bronze medal game and stayed within snitch range, only to fall to an Alexander Graham snitch grab. Finally, the long saga had come to an end. 2014 has been an era of change in Canada. They will start the new season autonomously with a lot of new leadership on board. The level-headed Clare Hutchinson will take over their media image, and the talented Chris Beesley will be in charge of their gameplay policies, along with many other competent volunteers. All of this leaves me hopeful for the future. Mistakes were made, but, for a young organization, that is the only way to learn. Canada is resilient, and they’ll be back. In fact, I’m confident enough to say that by 2016, we’ll all be predicting a 1-2 finish for the USA and Canada once again. And, this time, they will get that silver. I had the opportunity to snitch against every team at the tournament except for Belgium. The seekers from the six countries came in various shapes and sizes, and some were on opposite ends of the talent spectrum. In no particular order, here are my thoughts on the teams. Alexander Graham was quick with ridiculously long arms and an aggression that was borderline crazy. My fondest memory of him came during a play stoppage. He was about to sub in and his face was red. He was snarling and pawing the ground with his cleats, ready to attack me. It was awesome. His best attribute was his wingspan and his aversion to dropping low, making him a little more challenging to throw—especially because he didn’t want me to rip his jersey. His biggest flaw was that his main move was to reach for the snitch, and if he didn’t reach it, leave his hand there to linger as he kept pushing further and further. Unfortunately for him, this is extremely easy to defend against and tires the seeker out more than the snitch. Brian Wong was fast, aggressive and unafraid to hit the ground. He struggled against me in the first game we faced each other, but the next time we met, on just his second try, Wong had a clutch catch. He ran at me full speed and slid under my stiff-arm onto his knees. This was easily one of my favorite catches of the weekend. A big fella by the name of Dameon Osborne is a flanker on a rugby team back in Australia. I sadly didn’t have much time to snitch against him because the one Team Australia game I snitched, I injured my ankle. Osborne, in fact, caught me as I injured said ankle, making the catch questionable, but, in the end, legal. Despite my little time against him, I saw from his other games that he was aggressive, had a huge wingspan and was unafraid to lay out for a grab. Not much to say about the UK seeking game. Their players were your typical, athletic chasers-turned-seekers. They didn’t have much strategy besides “be aggressive” and “go low,” making them easy to throw. Over time, they could wear out a snitch by shotgunning seekers, but a dedicated seeker who put more effort into his craft would have benefited them greatly. I admit I wasn’t impressed with Sam “Sunshine” Roitblat when I saw him at Midwest Fantasy, but I knew not to let my guard down. Roitblat displayed a variety of moves at Global Games. Besides catching me and my fellow snitch Walter Makarucha Jr. with the move that has been popularized by World Champion Margo Aleman, creating contact on one arm before reaching around the other, Sunshine caught snitch Chris Champitto with a behind the back grab and Jack Harver with an entirely different move. This seeker’s greatest attribute isn’t his size—he’s a pretty tiny guy—but in his patience and calculated demeanor. He actually thinks about what he’s going to do, making him significantly more effective than seekers that favor aimlessly charging a snitch. Sunshine was, without a doubt, the best seeker of the tournament, and, I think, one of the best seekers in the world going into next season. It’s hard to rate Team Mexico because each time I snitched against them, I went up against a different seeker. Their starting seeker was small and not very technical-minded, which made controlling him extremely easy. However, in their fifth place game against Team France, their seeker sub caught me with the most legal two-hand catch I’ve ever seen, not even slightly restricting my movement. It was impressive, and I’m still not entirely sure how it happened. Mourad “Tarzan” Ghazi was one of the craftier seekers of the tournament. He was big, he was fast and he had some good moves, but he put way more effort into catching the snitch in some games than he did in others. I think part of it was his lack of a sub, but I also think he was just enjoying the game and being in the moment more than actually winning or losing. When he did put forth the effort, he was an impressive seeker who was harder to control than others at the tournament. He also had a good center of gravity, making it harder to knock him off his feet. The seekers of Global Games were a varied bunch, but all demonstrated athleticism and an impressive arsenal of moves. While the American seeker game continues to improve, the rest of the world is improving right along with it. I never doubted that Team USA would win Global Games. I never even doubted they’d win easily. But as for properly predicting the reasons they would win, I wasn’t even close. I thought Team USA would cruise to a gold medal because they could pass in a way no other team could dream of. I was wrong. I thought they’d cruise to a gold medal because their beaters were worlds above the rest. I was wrong. The real reason this team was able to win so comfortably is they played the most voracious defense the sport has ever seen. Every chaser, big or small, hit confidently and consistently. No one was ever walking; they hustled back on defense and cut off fast breaks that looked like they would be sure goals time and time again. The keepers were perfectly positioned in transition defense. They weren’t fading back toward the hoops; they were meeting ball carriers just past midfield, feet set, square to the opponent. The results speak for themselves. Team USA allowed just 13 quaffle points per game. When the United Kingdom frustrated the red, white and blue’s offense, the defense kept them from getting anywhere. When Australia threatened to compete with the USA, the defense shut the door. In sports, specific national team roster compilations are fleeting. Great ones might only get one tournament together, leading to fleeting memories of their play that stay with fans forever. Spain at the 2010 FIFA World Cup will forever be remembered for tiki-taka. US hockey at the 1980 games will always be known for their gritty play and Al Michael’s famous call. 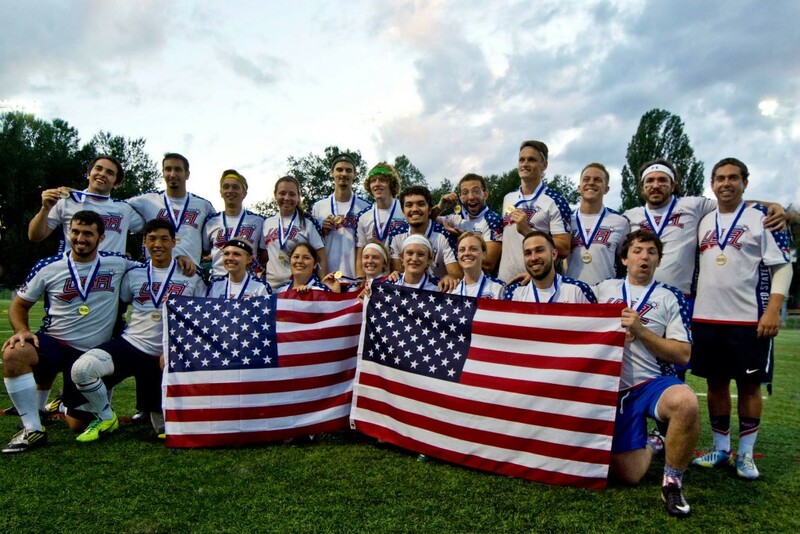 This American Global Games team will not be remembered for playing beautifully. They didn’t rewrite how quidditch is played or grit out shocking upsets. No, they’ll be remembered for Kenny Chilton running the whole field to make a point blank save or Hannah DeBaets ripping a quaffle out of an opponent’s grasp before breaking her broom diving on the loose ball. In both his first and his last pre-game speeches, head coach Mitch Cavender talked about this not being a sports movie. He harped on it not being a tournament where the favorites stumble and the underdogs pull off a miracle. And on the field, that is how his team played for him. With every hit and with every stop, they drained the hope out of their opposition. Perhaps then, it’s fitting that their final game was their most dominate. USA 210. Australia 0. No movie scripts. Just gold.